This is the beautiful boy that gave me that final push to follow my heart, and inspired me to pursue a career assisting dogs and bettering their lives. His story is short, as was his life. Brody was a German Shepherd/Yellow Labrador Retriever mix. As far as looks go, he was as beautiful as a dog could be. His face made you just want to hug and cuddle him. What was behind that face was another story. He was a shelter dog that I’d adopted at the age of fifteen weeks, who had no socialization, had been abused, and was terrified of the world. Although he loved being in the house with his two adopted “sisters” and myself, other human contact was petrifying to him. His fear was beyond what I could mend, and with a heavy heart I made a very difficult decision. Brody went to dog heaven at the young age of seven months. What he brought to my life and taught me is immeasurable. He will live on as I hold him in my heart, and I will be forever grateful for his lessons, and his courage. I fully believe that Brody trusted me as much as he could trust any human being, and found some comfort and happiness in my care. Peace be with you my “Big Boy”.... run like the wind with your tail wagging. Sasha was my Chow Chow/German Shepherd mix (12/20/99-2/27/15), and was my "assistant" in classes from day one at Brody's Boot Camp. I could not have pursued my career and passion without her by my side. Sasha loved her role as assistant and enjoyed helping me out in class, meeting new people and pups, and working happily for praise and an occasional treat. After six full years in the classroom, she earned a well-deserved retirement. 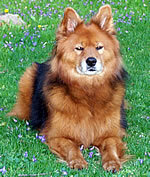 Sasha passed peacefully at home at fifteen years and two months of age. She was not only the best training assistant I could have asked for, but was also the most extraordinary dog, companion, and friend I've ever had the privilege of sharing my life with. Memories of her presence and performance in the classroom will always remain at Brody's Boot Camp, and she will forever live in my heart. Rest in peace, my sweet girl. You were absolute perfection every single day of your life. I have lived in the Seneca Falls/Waterloo area my entire life and have always been concerned about the well being of dogs. My own canine kids (of various breeds, shapes and sizes), have brought me much more joy and entertainment than I can tell you! Without a doubt, I will always have at least one dog in my life. In the past, I volunteered with a breed rescue based in Rochester, New York, which shared in my love and concern for the well being of dogs. Rescues, as with shelters, are crowded with abused, lost and unwanted dogs. Rescue groups are, thankfully, filled with angels that have saved many, many dogs' lives and give endlessly to their cause in time, energy and money. I am very proud of my involvement in this area. All my life I've had a passion for dogs and their well-being. They are the ultimate gift to man (and woman!) as they accept us, faults and all, and still love and respect us unconditionally. I've always had a dog in my life, each one being very different from the other, but all of which I've loved with my entire heart and soul. My dogs have all been socialized and given basic obedience training, which allowed them much more freedom and the opportunity to be involved in every aspect of my life. My journey and search for a way to really help dogs ultimately led me to volunteering at a shelter. I learned many things in this line of work, the most important being that family dogs are not meant to be discarded and turned over to a shelter due to an inconvenience such as moving to a new home, allergies, and certainly not for lack of training, among other excuses. The original purpose of animal shelters was to have a safe haven for homeless, lost and abused animals until a suitable permanent home could be found for them. They were not meant to be "dumping stations" points for the family pet. Unfortunately though, throughout the country our shelters are overcrowded and full of just such animals. Most dogs that are taken to shelters after living as part of the family in a home, are understandably quite confused, scared, defensive, and many just don't adjust to shelter life so they end up being labeled aggressive and sometimes are euthanized. This is not the life for a dog; the caring soul that was taken into a home, loved and gave love every day of its life. A dog is a living, breathing being with feelings, and they bond very firmly and quickly to their human pack. No, dogs are not human but they do have emotions. You would not discard a human child because they are sometimes an annoyance, a burden, take too much of your time, or some other inconvenience. Then why do it to a dog that trusts and depends on you, and wants to do nothing more than please you? I want to do something to improve the chances of pet dogs staying in caring homes. Basic obedience training and giving dog owners simple skills to teach their dogs is the best answer I can think of to accomplish that goal. It makes perfect sense to me that if you send your children to school to get an education, and you teach them lessons at home so that they will be happy, healthy, well adjusted, well mannered members of society, why then would you not do the same for a dog that you bring into your home as a family member? Like children, dogs need consistent rules and guidance. It truly isn't difficult, and is part of the commitment you make when adopting a dog. The rewards of obedience training are endless. And, dogs that are well trained, or at least have some basic obedience skills, have a lot more fun and freedom than untrained dogs. So here's to a long, fun and loving relationship between you and your canine best friend! 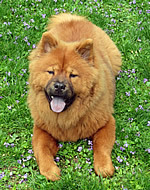 Tasha is a purebred Chow Chow, born September 7, 2015. In February of 2016 at the age of five months, she happily joined me in the classroom as my official training assistant. Tasha stepped into her new role with ease and she’s done a terrific job. She looks forward to meeting each and every new dog, and becomes quick play pals with most of them! Both Tasha and I look forward to meeting and working with you and your pup. And, we plan to have some fun along with learning in the classroom! 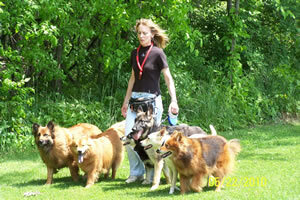 Member of the Association of Professional Dog Trainers www.apdt.com, whose mission is to promote caring relationships between dogs and people by educating trainers in canine behavior and emphasizing professionalism and reward based training. Member of Therapy Dogs International www.tdi-dog.org, which is a non-profit, volunteer group founded in the late 1970's that provides visitations of qualified dog/handler teams throughout the US and Canada. The primary objective is to provide comfort and companionship by sharing the dogs wherever needed. Volunteered with BrightStar German Shepherd Rescue - Rochester, NY www.brightstargsd.org, a non-profit organization dedicated to saving the lives of German Shepherd Dogs, by rescuing them from various situations and ultimately placing them with forever families who will provide the dog with a happy and healthy life. Past volunteer at local animal shelter in various capacities 2005/2006, where my major focus was to find forever loving homes for the shelter dogs by photographing them and doing write-ups for the shelter's Petfinder page. Attended many obedience and training classes instructed by others, and have combined the best of what I’ve learned to create a class that will teach you to train your dog to be an appreciated and respectable member of the family, and have fun doing it. Most of my experience has come from over 30-years of training my own dogs, along with training those of friends and family. For those dog “parents” who prefer natural products over chemicals and pharmaceuticals, for a variety of reasons including health and safety, there is a company that I highly recommend you check out. Wondercide Natural Products, based in Austin, Texas, USA was founded by a very caring dog owner. They have products ranging from flea and tick prevention and control, hip and joint support, itch and allergy sprays, along with many other natural human and pet products. Take a peek as I think you’ll be glad you did!